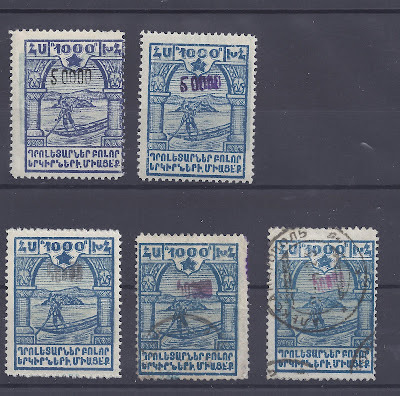 Though the Michel catalogue has a generally good listing for Armenia, it breaks down for the last issue from the 1919 - 1923 period, the Yerevan pictorials listed as IVa to IVk in unoverprinted form and 171 - 180 for the issued, overprinted stamps. 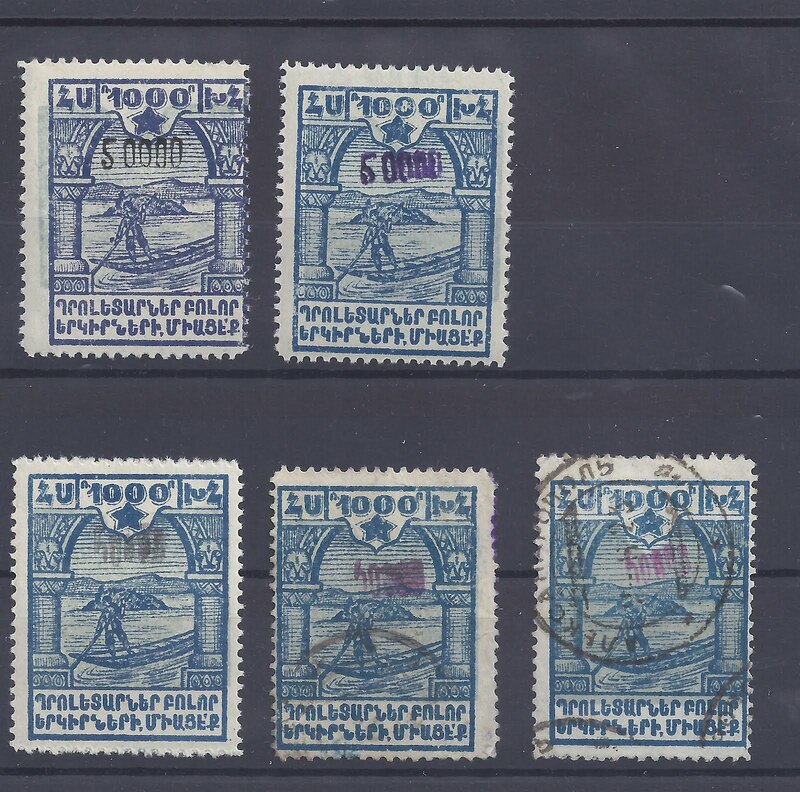 Above I show the 1000 rouble stamp (Fisherman on Lake Sevan) with a 50 000 rouble metal overprint in black and then in violet (Top Row) and with a rubber handstamp in black, violet and red (Bottom Row). Chronologically, the rubber handstamps came into use first and you do not find mint remainder stocks for them as you do for the later metal handstamps. In general, metal handstamps are normally found in black, occasionally (on some values) in violet and, to my knowledge, on only one value in red (the 200 000 handstamp). Dr Ceresa lists in his Handbook a Purple-Black and it is true that, quite often, on turning to the back of the stamp which looks black on the front one can see purple (or violet) pigments penetrating. But I am not sure that this variety can always be reliably distinguished. The 75 000 rouble handstamp, applied to the 3 000 rouble stamp, only exists in the metal version; there is no rubber handstamp for this value. It is probable that not all values can be found with Red or Black rubber overprints, but all (except the 75 000 just mentioned) can be found with Violet. It follows that a "basic" collection of metal handstamps will show all 10 values in Black and a "basic" collection of rubber handstamps will show all 9 values in Violet. An "advanced" collection will contain spaces where it is uncertain whether a particular value can or cannot be found with a particular colour overprint and in both mint and used condition.